Everyone knows that red wine needs to be aerated for a while before it is served. This is known as letting the wine breathe, and usually is done using a decanter or a carafe. Wine needs to breathe to allow it to open up, release its intended aromas, and of course, make it taste better. This process is usually reserved to red wines, even though there are some white wines that can be allowed to breathe as well to enhance the flavor. Note that the younger the wine is, the more desirable it is to let it breathe before serving. It is recommended to let wine breathe for at least 15 to 30 minutes before it is served. But often, if you are busy cooking a fancy meal for your guests, you might well forget to uncork the bottle on time to drink it at its best when the meal is ready to be served. A good solution to this problem is to use a wine aerator, a simple device that has been designed to let air into the wine as the wine is poured into the glass, mixing just the right amount of air with the wine at the precise moments. Basically, this means that you can open your bottle of wine, pour it out, and drink it literally right away. This review will compare the Vinturi and Metrokane Rabbit wine aerators which are the two most popular bought by Amazon customers. 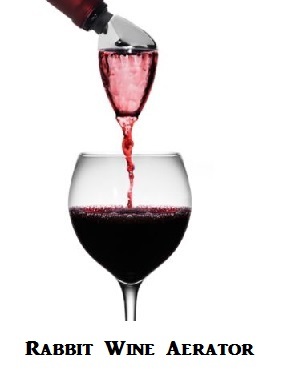 Wine aerators work according to the Bernoulli's principle which states that as the speed of a moving fluid increases, the pressure within that fluid decreases. They use the difference in pressure to pull in just the right amount of air, bubbling it together with the wine to aerate the liquid. The Vinturi aerator is a slick and elegant gadget, shaped a bit like a stylish over-sized bullet made of thick plastic that looks more like luxurious glass, and with a chic black stripe around it. To use it, you pour the wine from a bottle into a narrow glass-like reservoir held over your wine glass. The wine burbles through the aerator and flows into the glass below. If you also get the slick Vinturi Tower, then you can simply place the aerator into the tower's holder, place the glass underneath, and serve the wine with one hand. The stylish tower (about 12 inches high) not only eases the pouring of wine by holding the aerator, but it certainly adds elegance and drama to your table. 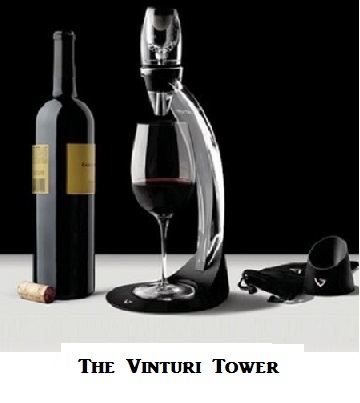 Note that the Vinturi Tower is not required for proper use of the aerator. But as mentioned, it frees one hand, and adds a touch of elegance to your table. Note also that Vinturi also offers an aerator for white wines. The Metrokane Rabbit aerator consists of two integrated pieces which can be easily detached for cleaning. The aerator unit is inserted directly into your bottle. 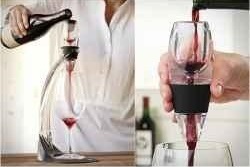 therefore you don't need to hold the aerator above your wine glass with your other hand while you are pouring the wine. You just pour the wine into your glass with a single hand. This aerator can also be purchased as a kit, bundled with the two-step waiter's Metrokane corkscrew made of steel with a built in serrated knife blade which allows the removal of all cork types with ease in a simple two step operation. It is really the type of corkscrew preferred by waiters and sommeliers everywhere. We have tried both these products, and even though we like the results better with the Vinturi, we have to say that the Rabbit works also very well. However, the latter does not seem to be as sturdy and solid as the Vinturi, and therefore it may not last as long. The quality difference is of course reflected in the cost of the Metrokane Rabbit aerator which is less than Vinturi's. So, if cost is a consideration for you, and if you don't intend to use the aerator very often, go for the Rabbit. Otherwise, if you are looking for something slicker to impress your guests and that will last a very long time, then go for the Vinturi. In terms of taste, both products improve your wine's bouquet and taste, and having tried both on different people, we were surprised to see that some preferred the results obtained with the Vinturi, while others preferred the Rabbit. Taste-wise our own preference still goes to the Vinturi, but we think this is more a matter of personal taste rather than quality of the wine produced. And as mentioned earlier, if you don't want to pay more, and you don't intend to use it very frequently, you will be quite satisfied with the Rabbit. 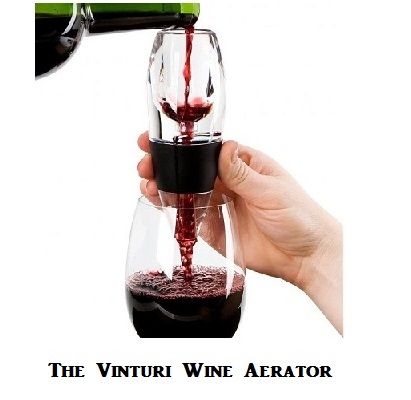 Finally, remember that the Rabbit aerator requires only one hand, while the Vinturi requires both hands for proper use, unless you also buy the Vinturi Tower which frees one hand. Note: Rabbit has more recently unveiled its Super Wine Aerator that has a sleeker design. Not only does it stay more securely in the wine bottle, it's also a better pour. The previous model poured more slowly and could once in a while experience random spurts. The new one pours faster with a steady and even flow. Both Rabbit aerators are offered below in the Amazon products section. Please click below the selected products for price info or to purchase. Note: When you click above you will get a choice of red or white wine aerator as well as other choices. Note: When you click above you will get both the red and white wine aerators.